Solar cooker designs can look deceptively simple when placed next to some of the more traditional forms of cooking equipment. Yet solar ovens can have cooking times comparable to a conventional oven reaching temperatures of over 120oC (250oF), and cooking about 4 or 5kg (about 10 pounds) of food on a sunny day. The advantage of solar cookers is that they can cook large quantities of food slowly and evenly. Millions of people can’t find enough wood to cook, using solar cookers is a good idea. So how do solar cookers work. Solar cookers work because sunlight carries lots of power. When sunlight hits a surface with an area of 1 square meter, there is about 1,000 watts of solar energy available from the sun on that surface. Sunlight is concentrated in the cooking area that gets hot enough to cook food by using mirrors or any reflective surface. The more sunlight that is captured or reflected, the more power that can be generated. While there are many different solar cooker designs to choose from, the most widely used and most foolproof, is the Solar Box Cooker. Solar box cookers are large insulated boxes painted black on the inside (to absorb sunlight) with a transparent cover (usually glass), and one or more reflective panels that allow more sunlight to enter the cooking chamber. The sun’s heat is captured inside an enclosed area usually a box, hence their name, and is absorbed by the food and pots or pans inside. Solar box cookers sometimes have an insulated cooking chamber to prevent heat from escaping. the food being cooked is placed inside the chamber in a dark-coloured pot. Just as we cook differently with stove tops, ovens and microwaves, different types of solar cookers are used differently. As the food can be cooked inside a sealed box, solar box cookers act as solar ovens and can be used to cook or bake food and even pizza’s using a low heat over a long time. 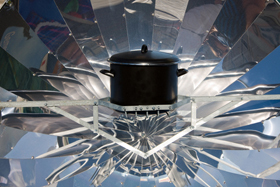 Since it is almost impossible to burn food in a solar box cooker, it does not matter how long food is left to cook. To learn more about “Solar Cooking” and how to use the sun to cook your food, or to follow a step-by-step guide on how to make a solar box cooker using simple stuff you have lying around at home then Click Here to order your copy from Amazon today and find out more about solar cooking, solar cuisine and cooking with the sunshine . a wonderful invention. it will be very useful to protect nature and flowers. It is a great innovation. It is pollution free & can be used for cooking foods for huge number of people. this is the most important thing ever you can use this if you are stranded like somewhere else and like you want to cook so you can use that method. Nice,we are doing research on the 3 solar ovens and this is the perfect website 4 it. Definitely would like to try this one day. We install solar panels on roofs and convert them to electricity for home use. Should definitely harness this technology and use it to cook food. Thanks for all the detailed info. This is excellent. I am grateful for the article. Really Cool and helped me understand. I have a question about using glass jars as cooking vessels in solar cookers. The lids of most commercial jars have gaskets in them, and in the USA, many of these gaskets apparently are made with PVC. Jar lid manufacturers say the PVC is stable at temps up to 225 degrees F. When these lids are painted black and used in a solar cooker, the lids can get heat up to 250 degrees. So is there a health danger in cooking food in a vessel that has a little PVC in it that may be heated above the temperatures it was designed to withstand? Hello Ramon, try a test jar and see what happens. If the seal melts then don’t use. Can you not put the jar’s contents in another pot on the solar cooker.